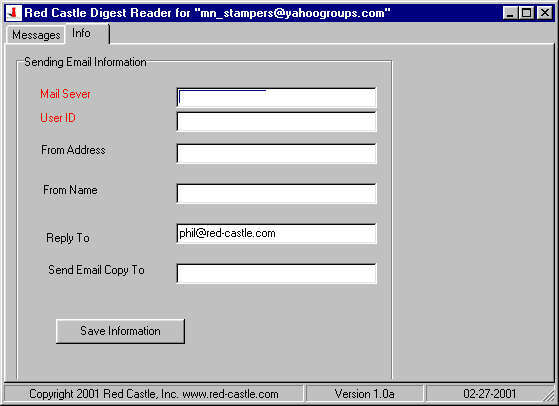 Digest Reader -- FreeWare by Red Castle, Inc.
Click here to download a program to help read list digests on you computer. Updated on 10-20-2004. To use download the program, save to your hard drive, and run the program, then follow the simple steps in the on screen instructions. Remember where you have saved the file after downloading it, so you can read digests in the future. Displays message subjects and who from in a simple to read table format. With a simple check mark lets you skip messages you do not what to read. One click to advance to the next message you want to read. After reading a message, you can do one click to advance to the next message or you can click on copy to clipboard (lets you paste the message into your word processor), or click on reply to have a reply message formated with the orginal subject and the text is quoted, you type your reply select if you want it send to the group, the orginal send or both or just to yourself. When you start the program you will see this display. 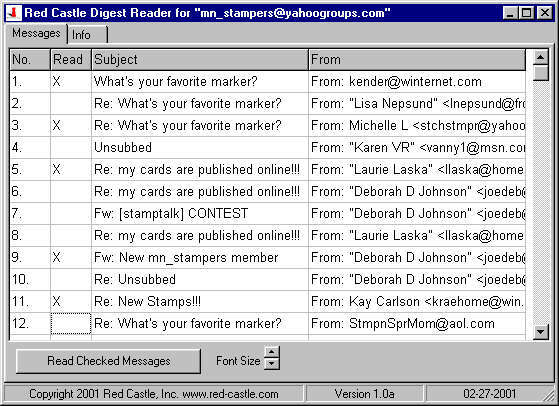 Display the digest in your email program, and click the left mouse on the body of the text. Do a Ctrl-A to select the complete digest. 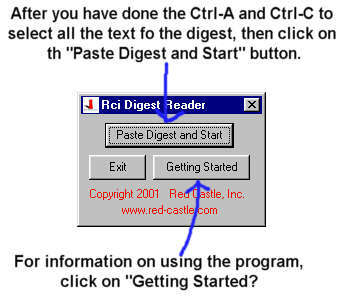 Do a Ctrl-C to copy the digest to the clipboard. Click on "Paste Digest and Start" in the RCI Digest Reader. Click on the "X"s you do not want to read. Click on "Read Checked Messages" to read each message. messages click on "Done". Repeat 1-7 for the next digest. The first time you want to reply to an email, while using the digest reader you will have to enter the following information unter the "Info" tab. Hope you enjoy the Digest Reader program, and tell your friends about the program. (c) Copyright 2001-04 by Red Castle, Inc. Red Castle, Inc. - P.O. Box 1841 - Saint Cloud, MN 56302-1841 All Rights Reserved.